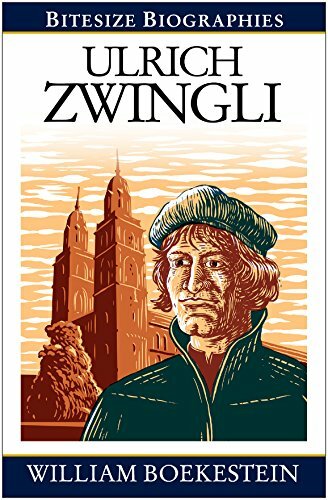 William Boekestein’s contribution to the Bitesize Biography series, Ulrich Zwingli, is the latest of these little books to make it to press. I’ve previously reviewed the volumes on John Chrysostom and George Whitefield. All have been enjoyable and engaging. Ulrich Zwingli follows the basic formula of the series, which includes a timeline, a brief introduction, and a walk through progression to importance, major conflicts, and reason of significance. The volumes all end with a summary of the legacy of the individual. This means that these books, including Boekestein’s recent edition, have all the pieces necessary to a good biography. Zwingli is an interesting character within Church History and often less covered than other reformers, like Luther and Calvin. This is, as Boekestein notes, in part due to Zwingli’s untimely death, which prevented him from publishing revisions (as Calvin) or as much (as Calvin and Luther). Zwingli was a first generation Reformer. His shift from the Catholic Church occurred roughly simultaneously with Luther and in parallel. While there was undoubtedly some interaction between the two early on, the theological movement away from the Roman church had a basically independent genesis for each of the men. Unlike Luther, however, who had a political power to support his religious efforts at Reform, Zwingli became much more involved in the daily political squabbles of his Swiss canton. This also contributed to the diminished literary production of Zwingli, as well as some of the attitudes toward reform, which for Zwingli required convincing many more people along the way. Switzerland was also in a more precarious political situation because of the small size of the Cantons and their proximity to Italy. Boekestein highlights these differences and brings out some of the unique contributions that Zwingli, often considered the father of the Reformed faith, makes to church history. This story is told in a winsome manner, in general. The writing is alive and engaging. This volume, like the previous in the series, is an enjoyable evening read for someone interested in history and theology. My greatest point of contention with this volume is the Boekestein diverges from the pattern, which is generally descriptive theologically and historically, to insert a paedobaptist polemic into the volume. Certainly the issue of the proper subject of baptism is bound to come up in a volume on Zwingli, since it was Zwingli’s teaching in Zurich that lead Conrad Grabel and others to follow the text of Scripture to the doctrine of believer’s baptism. Dealing with the controversy was inevitable, but this doctrine is handled differently than other controversies. Unlike the concern over iconogrophy, marriage of clergy, and the controversy of the Lord’s Supper, all of which Zwingli engaged in and which Boekestein covers descriptively, this volume presents a defense of Zwingli’s position and describes the Anabaptists as “rebaptizing” repeatedly, instead of presenting their belief that they were merely baptizing for the first time. I appreciate Boekestein’s desire to demonstrate the importance of the doctrine, due to his commitments to a covenantal understanding of salvation, which leads to the idea that baptism replaces circumcision as the sign of the covenant. However, this digression into polemicism is a blemish in an otherwise excellent volume, and completely unnecessary for the project under consideration. As a Baptist, I obviously reject the notion that infant baptism is preferable to believer’s baptism, and would have preferred if this controversy had been handled in the same manner as the others. One danger of descriptive biographies like this is the potential to devolve into hagiography. Thankfully, Boekestein does not do this. He relates in general terms the sexual sin Zwingli participated in before finally getting married. The volume also relates some of Zwingli’s failures in judgment, including his support of the persecution of the Anabaptists. These are points that much be discussed, but which do not diminish the overall contribution Zwingli made to the history of the church. I am pleased to see that this latest volume includes a brief list of recommended reading, which was a lacuna I first noted in my review of the volume on John Chrysostom. Boekestein provides a single paragraph summary of where the interested reader should go for more on Zwingli, which makes the helpful approach of the Bitesize Biography series even better. Laying aside the small digression discussed above, this is an excellent volume. This was an enjoyable little book to dive into, sitting in my overstuffed chair on an evening near the end of the semester. There is healthy balance between history, theology, and good story telling that make this entire series a treasure for the contemporary church. I recommend this series, and this book, heartily. These books make good pleasure reading for adults, and would be useful volumes for studying church history in the upper grades of a homeschool curriculum. I look forward to many more volumes to come in the series.